Whether you are a recreational or competitive rower who needs to be able to train off the water or someone who enjoys a challenging, effective, full-body workout, the Concept 2 Model D Indoor Rower is a great workout tool for rowers and gym rats alike. It is an excellent training tool for elite rowers and yet can easily be used by a complete novice, making it a unique piece of workout equipment. One of the most important features of either of the Concept 2 Indoor Rowers (Model D or E) is the PM3 or PM4 performance monitor. 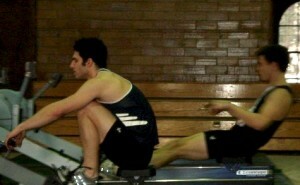 Both give the rower excellent stats about their workout on a stroke by stroke and overall basis. The user can choose to see their output in meters, splits, calories, or watts as well as setting it up to give averages for certain segments of the workout as well as the overall average. It has a full menu of premade workouts to choose from but also has a straightforward, user-friendly option to create your own. It stores at least 1 MB of workouts in memory and after a workout, the user can easily toggle through the various output units to see their performance across distance, watts, calories, and split. While it may sound complicated because of the wide range of features and options available, the monitor is extremely simple to use and become familiar with, and it is an incredible training and learning tool for anyone using the machine. As far as the physical machine goes, the Model D has been ergonomically designed as the result of over 30 years of production by Concept 2 and is the 4th model of indoor rower designed by the company. The handle, footstretchers, seat, and slide have been designed for a natural and comfortable position for a wide range of sizes and heights. The spiral damper controls the resistance of each pull and is easy to adjust, even while rowing. The indoor rowers can be easily stored in two parts without tools, making it convenient at home or in a gym as well as easy to transport. It also comes with caster wheels that enable it to be moved without difficulty within a room. The Concept 2 Model D Indoor Rower is a sleek, single piece workout machine that provides vital training for rowers and a challenging workout for non-rowers. It was initially created to give rowers the ability to practice off the water, and while it continues to be used for that purpose, it has become an important training tool as well as a popular workout machine for non-rowers. The Model D definitely gives a bang for its buck. If you are buying for a team, it’s a necessary investment in future fitness and success. If you are interested in one for a gym, it’s a great warm up tool to get the whole body ready to workout as well as an excellent workout on its own that is low-impact. If you are considering one for yourself, it will soon pay for itself compared to a gym membership and provide you will a full-body workout that can build both endurance and strength. The indoor rower is a fairly simple piece of equipment with few unnecessary features. The monitor offers a wide range of workout options, including “games,” but if you just pick up the handle to row, it immediately begins the most basic workout option and stops when you stop rowing, still recording it in it’s memory. A few accessories that you may be interested in are heart rate equipment and sliders, which simulate rowing on the water. By now you should be able to answer the question, who uses the Concept 2 Indoor Rowers? The answer, of course, is everyone. It is the indoor workout machine of choice for all elite rowers, used by the historic rowing clubs of the UK and Ivy Leagues and all national and collegiate rowing programs. NCAA has a tent of Concept 2 Indoor Rowers available for athletes to warm up and practice on at NCAA championships, and Concept 2 are the only indoor rowers used at indoor rowing competitions like CRASH-B’s in Boston. 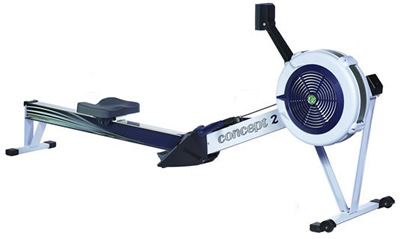 The Concept 2 Model E is the other model of indoor rower currently sold by Concept 2. It differs from the Model D in a few ways. First of all, it is a couple hundred dollars more expensive. It has a few slight differences in machine body, materials used, and weight. One of the biggest differences is the PM4 monitor automatically comes with the Model E and PM3 monitor with the Model D, but the PM4 can be sold with the Model D for an additional $150. There are indoor rowers not made by Concept 2, but Concept 2 was the original creator of the air resistance indoor rower, which revolutionized the field. WaterRower also makes indoor rowers as do a few other brands, but Concept 2 is the dominant brand in the field. Concept 2’s Model D Indoor Rower is the off-the-water training tool for serious and recreational athletes and it provides a great workout to anyone who uses it. It is definitely worth the money for a quality workout machine with a solid warranty, tested design and functionality, and ease of use and storage.